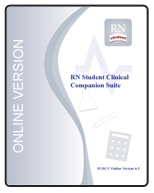 Designed for classroom and individual study, the new PEPID™ RN Student Clinical Companion tutorials offer curriculum support. They are the fastest way to train instructors and students about how to use PEPID informatics software on PDAs and online. Two tutorials (one for PDA users and one for our internet program, PEPID Online), show how to use PEPID with real-life examples. Each contains illustrations, screen shots and an exam. 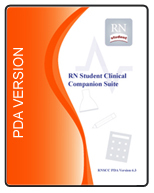 Chose to download the PDA version, Online version or both. PEPID™, product names and logotypes are trade marks of PEPID LLC. The article is copyright © 2005 by the American Society for Clinical Pharmacology and Therapeutics. Other product and corporate names may be registered trade marks of their respective owners.